On August 8, the St. Louis chapter of the America Needs Fatima campaign hosted an afternoon social to bring together all the old and new friends and volunteers who helped coordinate the visit of the famous International Pilgrim Virgin Statue of Our Lady of Fatima to the archdiocese in June. 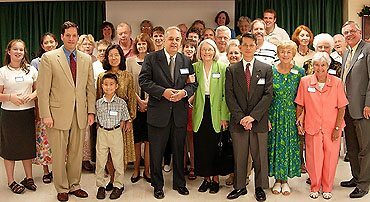 Local members Dr. and Mrs. Frederick Zivnuska were the principal organizers of the successful visit which counted on the support of many clergy and lay faithful. American TFP vice president, Thomas McKenna, was invited to speak at the social about his experiences as a custodian of the famous statue over the past two decades. He also explained the America Needs Fatima campaign’s goals, activities and future plans. By conservative estimates, over 20,000 people came to venerate the statue during her three-week stay in St. Louis. This entry was posted in Events of 2004 by TFP.org. Bookmark the permalink.